Recently, a number of people from my church visited Israel as part of a Holy Land tour. I was kind of jealous... in a good way. I'd love to go on one of these tours sometime! I think it would help me understand parts of the Bible better, and help me grow in my faith. Well... I don't know if I'll ever go on such a trip. Young Living's 'Oils of Ancient Scripture' collection is the ideal way to experience and enjoy the aromas that are commonly referred to in the Bible. 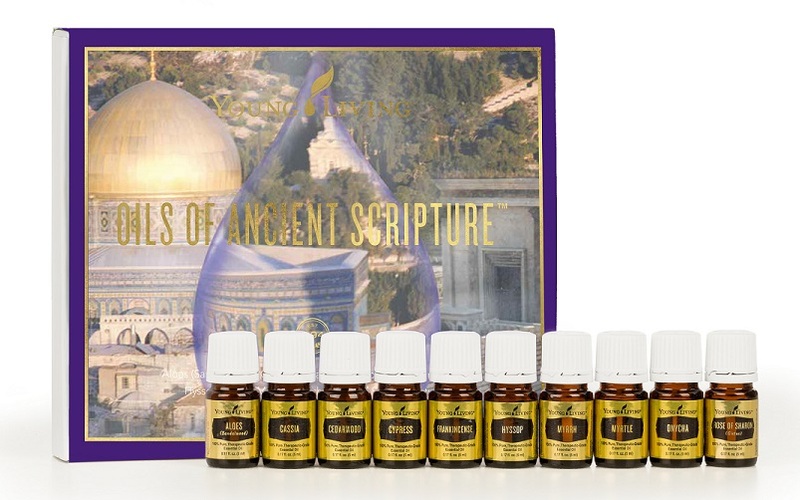 This set of 10 oils from the most significant plants, botanicals, materials, and resins in Scripture allows you to transport yourself to the world of the Bible... right from your own home! Essential oils are known for their unique ability to deliver both spiritual and emotional support in a way that's easy, enjoyable, and incredibly renewing. Here's your chance to experience the same at any time you'd like... conveniently in your own home... or anywhere you take your kit. To get your own set of the 'Oils of Ancient Scripture Collection' just Contact Me and I'll help you order one. The retail cost is $270.72. Wholesale pricing is also available at $205.75, bringing the price to just a little over $20 per bottle. To have these oils available at all is a remarkable blessing... especially when you consider in biblical times the amount of spikenard oil used to anoint Jesus was valued at about three-quarters of a year's wages! You don't have to pay close to that for this entire kit of oils... and it's also much less than the cost of a trip to the Holy Land! If you would like to order your own 'Oils of Ancient Scripture' collection -- or if you have any questions -- CONTACT ME.